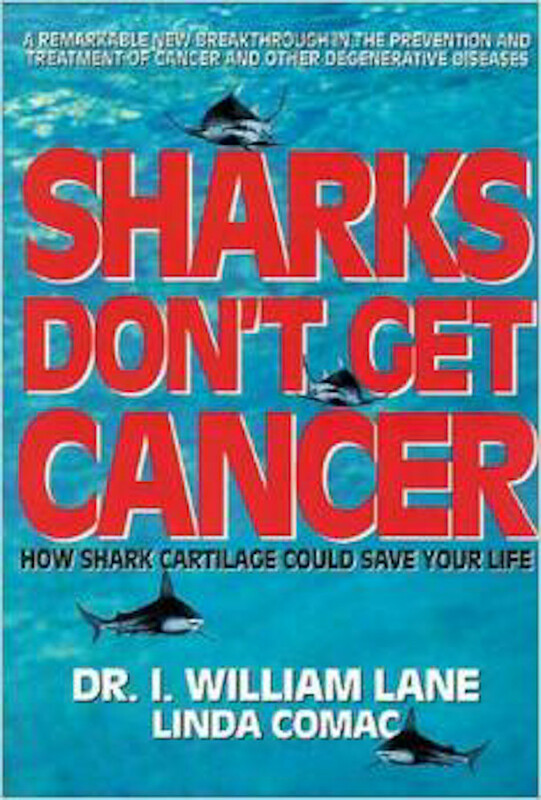 In 1992, Dr. William Lane (Ph.D.) authored the paperback book Sharks Don’t Get Cancer, filled with bizarre medical claims, which created international fame along with his interview with Mike Wallace on 60 Minutes, that helped launch his company, earned $ millions, and ended in lawsuits, fines paid to the FTC and FDA, and restitution to the public. This is a brief history about how a health food company created some fiction and made a lot of money … selling a product to the most desperate people … people afflicted with cancer. Lane’s book of approx. 100 pages, still for sale on Amazon for $1.54, claims shark cartilage could cure or fix almost any medical condition including, but not limited to: cancer treatment, cancer prevention, diabetes, glaucoma, hemorrhoids, arthritis, psoriasis, osteoporosis, colitis, wound healing, etc. etc. etc. Basically, just name a disease and his book claimed that shark cartilage would cure it. The basic premise of the book – Sharks Don’t Get Cancer -was an exaggeration, because sharks do in fact get cancer. Most of the rest of the book was composed of unsubstantiated medical claims, most of which were false. The next step was to make a shark cartilage product and sell it to those multitudes who had lost all hope of surviving cancer. For a few years, life was good. Lane sold shark cartilage and made lots of money from shark cartilage, first under hisCartilade label, then under his Lane Lab’s Benefin label. Unfortunately for most of those people, Lane was just selling them “hope” in a bottle. In 1996 a competitor – Seagate – began taking samples of most of the major brands of shark cartilage off-the-shelf and having them analyzed by independent labs. Richard Lentz owner of Seagate who was an expert on how shark cartilage should look, smell, and taste (since Seagate by then had been processing shark cartilage for 5 years), had noticed that most of the competing shark cartilages being marketed had none of the physical characteristics of real shark cartilage. The lab reports confirmed, what he had already guessed — that over 80% of the shark cartilage being sold by these companies during those years was being cut with filler. Lane’s Benefin brand Shark Cartilage was sampled and found to be among those 80% — what they claimed on their label was not in the bottle. The independent lab reports were published in the now famous “Red Book” and given out for free to any store and any person in the health food industry during the 1990’s. Lane Labs was embarrassed by the contents of the Red Book. They really should have been embarrassed by the contents of their own bottles. Anyway, they filed a $20 million lawsuit in Federal Court in 1997 against Seagate and Richard Lentz alleging false advertising and assorted grievances under the Lanham Act. In the U.S., unfortunately it is easy to file a lawsuit and make false claims. However, there comes a day when you must prove it in Court. Lane was shown that Seagate had 3 independent labs analyze their product and reach the same conclusion — that the product in their bottle was not what was stated on their label (pure shark cartilage). In 1998, Lane Labs’ attorneys contacted the Federal judge presiding over the case and begged him to allow them to drop their lawsuit. Their appetite to have their day in Court was diminished by the fear that they would lose and that the statements in the Red Book would become public knowledge. Seagate turned over all their files in 1998 to the FDA’s District Office in Newark, New Jersey that was putting a much larger lawsuit together against Lane Labs. Lane was warned by the government to stop falsely advertising their product, coincidentally beginning in 1997. They ignored the FDA’s order. The FDA filed their own lawsuit and won in 2004. Along with multimillion dollar fines from the FDA and FTC, Lane was ordered to cease the distribution of Benefin Shark Cartilage along with several other Lane products, and make restitution to any customers that purchased that product between 1999-2004. So in summary, even if you go beyond their false advertising and medical claims, the thousands and thousands of people that purchased Benefin Shark Cartilage as a cancer cure had no chance of it helping them … because even if the false medical claims were valid, the product in their bottles was not pure shark cartilage. Real Shark Cartilage really does have some promise with helping people and their joints. Seagate has been in continuous production of 100% pure shark cartilage since 1993 and is happy to report that we have had over 22 years successfully helping customers with their joint issues. 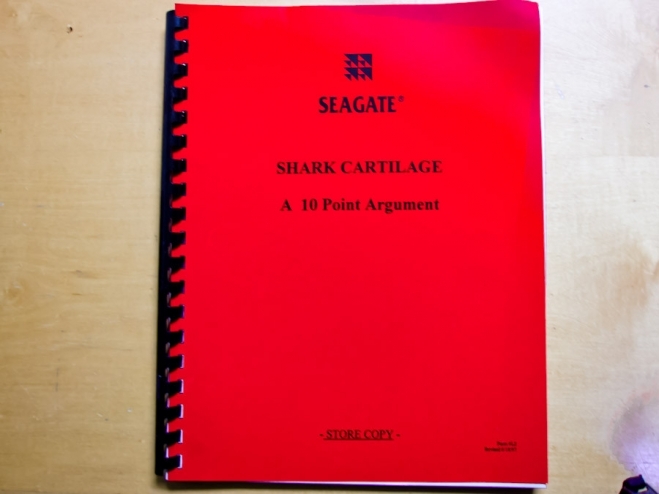 Of the over 40 companies that were selling shark cartilage in 1997 and were sampled and analyzed as part of the Red Book study, Seagate is one of only two companies on that list that is still selling this product. The other company, believe it or not, happens to be Lane Labs. The language in the FDA settlement of their lawsuit may have eliminated Lane Labs’ Benefin Shark Cartilage, but it did not consider that they could call it Lane Labs Shark Cartilage. Sometimes it helps to have a crafty lawyer. The Court order stopped them from specifically selling Lane Labs Benefin Shark Cartilage. But it did not stop them from changing their label and calling it Lane Labs Shark Cartilage. Seagate has since become a much larger company and now manufactures over 37 products, none of which are cut with fillers or make false claims. Grey reef shark Belize, 110 ft. This photo was used in one other blog, if anyone happens to notice it again. However, it seemed appropriate for today’s posting. This shark does have real teeth. Even more interesting than the shark is the diver in the top left corner of the photo who was trying to blend in with the reef and hide. The color in this photo was lost because of the absorption of all but the blue wavelengths beyond 5 feet and because the photo was taken at a depth of 110 ft. This shark was approximately 8 ft. from the camera and 6-7 feet in length. Most people believe that sharks are very dangerous and aggressive, when in fact most are very timid and easily spooked by movement from the diver. They are very difficult to capture in a picture. It required fast swimming to catch up alongside this shark to take its picture before it vanished back into the ocean depths. Seagate, by the way, discontinued shark fishing in 1999. The small amount of shark cartilage that we still process is derived from our local fish market in Ensenada, as part of a small food fishery. There are no endangered or threatened species of sharks being captured in this region. After reading your article “SHARKS DON’T GET CANCER” MYTHS, LAWSUITS, AND FILLERS,” I am impressed and sending high praises that you went after this company. Thoroughly enjoyed reading this article. People have to be so proactive in what types of ingredients they put in their bodies.